The fundamental trigonometric identities, graphs, and reduction formulas are given in the Appendix. The trigonometric functions are periodic. A function f is periodic if there is a positive number p such that f (x + p) = f (x) for each x in the domain of f. The smallest such p is called the period of f. The graph of f repeats every p units along the x-axis. 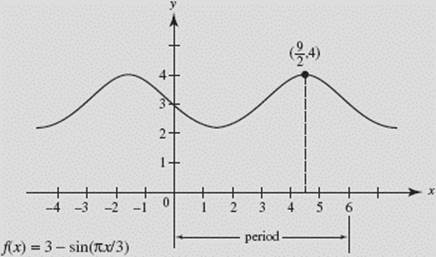 The functions sin x, cos x, csc x, and sec xhave period 2π; tan x and cot x have period π. Consider the function f (x) = cos (kx). (a) For what value of k does f have period 2? (b) What is the amplitude of f for this k ? (a) Function f has period since this must equal 2, we solve the equation getting k = π. Find (a) the period and (b) the maximum value of f.
(c) What is the smallest positive x for which f is a maximum? (a) The period of f is or 6. (b) Since the maximum value of −sin x is −(−1) or +1, the maximum value of f is 3 + 1 or 4. The graphs of f (x) = sin x on and of its inverse f −1(x) = sin−1 x are shown in Figure N1–7. 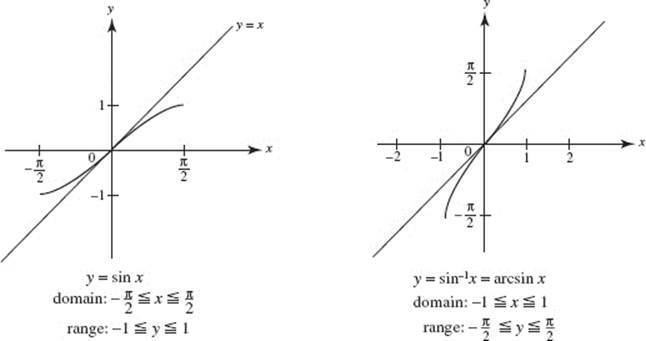 The inverse trigonometric function sin−1 x is also commonly denoted by arcsin x, which denotes the angle whose sine is x. The graph of sin−1 x is, of course, the reflection of the graph of sin x in the line y = x.